Oh, wasn't that a dainty dish to set before a King! And with that, Nogbad hears no more as the boys pass out of earshot. However, he has heard enough to give him a particularly diabolical idea, and with that he departs with his crows to his hiding place. That night, seen only by an owl, Nogbad sneaks out with his barrow and removes two sacks of flour from the mill. From then on, for several days, Nogbad is not to be seen; the only clue as to his whereabouts being the smell of cooking wafting from his secret cave. As the days pass, the Nogs grow busier and excited at the forthcoming birthday of Noggin, which would be marked with a procession through the city, followed by the giving and receiving of gifts and finishing in a great feast to which all (except, of course, Nogbad the Bad) were invited. Having finished making his father's present, a bored Knut heads down to the castle kitchens, but the staff are all to busy preparing the feast to entertain the Prince. Knut amuses himself for a while by wandering around the masses of food and gallons of drink in an unsuccessful search for a snack. As he ventures out into the courtyard, he sees a large trolley holding the biggest pie he has ever seen. He rushes back into the kitchen to ask the chief cook, who tells him that the pie had been found their waiting in the morning, delivered by persons unknown in the night. Knut returns to marvel at the pie - truly a work of art - with "Happy Birthday Noggin" lettered neatly on the top. Curiosity soon gets the better of the hungry prince, and he prizes the top off a corner of the pie for a look inside. However, the peculiar smell emanating from inside the pie soon convinces Knut that his hunger can wait. Concerned, Knut goes in search of his mother, Queen Nooka, who he finds trying to feed bread and honey to her canary. Knut tells his mother all about the pie, but his Nooka tells him not to worry, as they will all find out what is in the pie when it is opened at the feast. 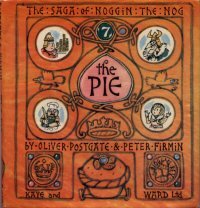 Still worried about the pie, Knut goes in search of his father and is directed to the counting-house where Noggin is counting the money in the royal treasury and has left strict instructions not to be disturbed, as the guards on the door tell the Prince. Knut decides that it is time to take action himself, and runs around the city and gathers twelve of his friends to whom he explains his dilemma. He goes on to explain to the bemused children how they will perform a play and leads them all to the castle courtyard, where he marks a cross in chalk on the courtyard cobbles. Equipped with a table and chairs, some old knives and plates and tankards, the children soon begin noisily enacting the forthcoming birthday celebrations, and make a point of dragging the trolley carrying the pie out into the courtyard. After several minutes of loud festivities, Knut beats a gong and calls for silence while Noggin cuts the pie. And at that moment, in a cloud of pastry, Nogbad bursts from the pie, throwing the crust aside as four and twenty of his crows fly out. Nogbad raises his sword and shouts to challenge Noggin, but very quickly realises that far from being in the banqueting hall with his crows attacking the guards and the guests, he is stood in the castle courtyard, surrounded by children, in a pie that is beginning to roll away on its trolley. The trolley gains momentum, but soon comes to an abrupt stop catapulting the Nogbad and the pie into an ornamental pond. As Knut runs to summons the guards, another commotion breaks out from the kitchen garden as one of Nogbad's crows bites the nose off one of the castle maids. Fortunately, Queen Nooka's canary is able to recover the missing nose and return it to the maid, who is thankfully able to get it to stay back in place. With the turmoil of the missing nose over, the Nogs rush to the pond, but once again, in the midst of the confusion, Nogbad has slipped away, leaving only a rather large and soggy pie base. As the guards drag the pastry from the water, Noggin comes out of the counting house, his counting complete and oblivious to the day's excitement with "I'm hungry. What about that feast?" Included on "The Sagas of Noggin the Nog" and "Beebtots"